This good-looking folder is the intelligent choice for style, functionality and practicality. The drop-point blade is ideal for a wide range of cutting applications. The blade is built of 8Cr13MoV for good edge retention and easy re-sharpening. 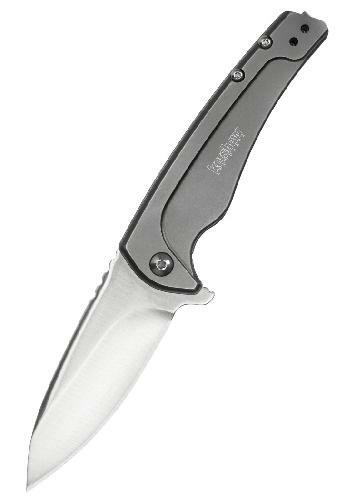 But Kershaw adds a high polish to the blade for an exceedingly classy look. The handle is pure steel with attractive, machined contouring that makes it stand out from the crowd. The polished backspacers and other hardware contrast handsomely with the handle's matte grey titanium carbo-nitride coating and visually tie-in with the polished blade. Opening is smooth, easy - and entirely ambidextrous - with the SpeedSafe assisted opening system and the built-in flipper. A frame lock secures the blade open during use. For a final practical touch, the heavy-duty deep-carry clip is left/right reversible.